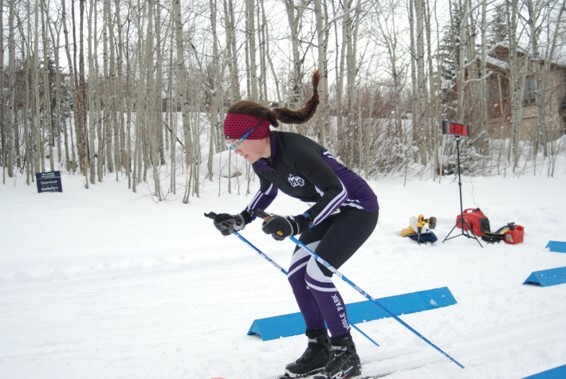 Aspen, CO– The MPHS Nordic Team traveled to Aspen for a pursuit race on Saturday, February 3rd. Facing the most challenging snow conditions so far this season, 14 men and 8 women took on a very large field over a hilly 5K mass start classic race in the morning followed by a pursuit start 3K skate in the afternoon. For the skate race the athletes started in the order and with the same time delay that they finished the morning race. Using the new CHSSL (Colorado High School Ski League) wax protocol, which dictates the glide wax that all schools will used based on anticipated snow and air temperatures, the team had already glide-waxed with HF8, a high fluoro wax designed for warm conditions. After a long bus ride the team arrived in Aspen to find the snow at Aspen Valley Ski Club to be skimpy, soft and slow. Coaches conspired to decipher the perfect kick wax combination. Then the wax team, consisting of coaches and parent volunteers, hustled to get 22 pairs of classic skis waxed in time for the starting gun. In the morning classic race the men came in 5th out of 12 teams but were just 4 points from a podium spot, led by Sebastian Brower in 10th in a time of 15:26, with freshman Alex Holinka close behind in 15th (15:41). Vinny Troccoli also scored points in 21st (16:10). Next for MPHS were Kimo Sullivan (36th), Guy Granger (40th) and Ethan Callarman (56th). Also completing the challenging course were Wil Cleveland, Isaiah Callarman, Will Kuhns, Jeremy Peterson, Eric Berry, Aaron Sanders, Jonathan Siefken, and Evan Olsen. The women’s team finished in 8th overall for the classic race with senior Emily Jensen sprinting in for 20th in 20:00, Lizzy Barker taking 26th (20:27) and Raelee Granger rounding out the points in 30th (20:46). Next was Maggie Barker (54th) with Katelyn Cimino (60th) close on her heels. Freshman skimeister Emily Lantermans, Selena Stoncius and Emily DePlata rounded out the team finish. In the afternoon skate race the men’s team placed an impressive 4th out of 13 teams, defeating perennial rival Steamboat Springs High School. This time Alex Holinka led the charge in 10th with an impressive time of 10:18 with Sebastian Brower next for MPHS in 14th (10:31). Vinny Troccoli (24th), Kimo Sullivan (37th), Wil Cleveland (40th), and Guy Granger (52th) all had great races as well. Ethan Callarman, Isaiah Callarman, Aaron Sanders, Will Kuhns, Jeremy Peterson, Jonny Siefken, Eric Berry, and Evan Olsen wrapped it up for MPHS. The women fared better as a team in the skate race, finishing in 6th place. Emily Jensen continued to lead her team bringing home top points with a 12th place finish (12:29). Lizzy Barker also cracked the top 20 in skate (13:04). Maggie Barker rounded out the points in 42nd (14:44). Also coming on strong in the afternoon sprint were junior Katelyn Cimino (53rd) and sophomore Selena Stoncius (59th) and freshman skimeister Emily Lantermans in (67th). The team missed having senior Raelee Granger in the skate field as she nursed a sore shoulder and wisely opted to save her effort for the next race. The team will have and break from racing this weekend but will continue to hone their fitness for one last regular season race, a mass start classic 5K in Minturn on February 17th. So far 10 men and 4 women have qualified for the state meet in Leadville on February 22-23. 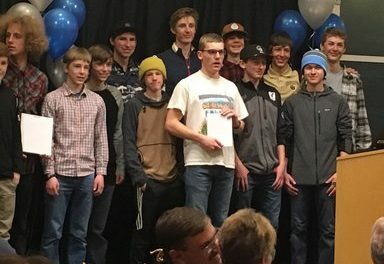 About MPHS Nordic Team: The Middle Park High School Nordic team is based out of Granby, CO and trains at Snow Mountain Ranch Nordic Center. The co-ed team welcomes all levels of experience, from seasoned racers to first-timers. This year 13 women and 16 men are suiting up to represent the MPHS Panthers. Several athletes also train and race, either full- or part-time, with the Winter Park Comp Center RMN (Rocky Mountain Nordic) team. The team has been training 5-6 days a week since early November, which was quite a challenge early on given the dry conditions this year. 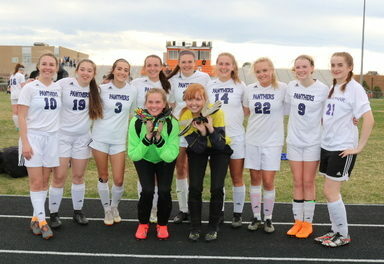 Coaches designed a variety of dryland sessions to prepare the team for the season to include striding and bounding with poles, bootcamp-style strength and agility training in the gym, running and fun relays in the soccer dome. They’ve been training on snow since early December. Not only are these athletes tough competitors but they face challenging conditions even at practice, to include darkness, blizzards and even the occasional moose encounter. Nothing that a headlamp and warm layers can’t overcome! Visit MPHS Nordic website here. 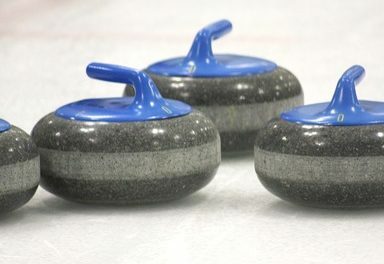 Nordic athletes compete in both classic and skate disciplines. 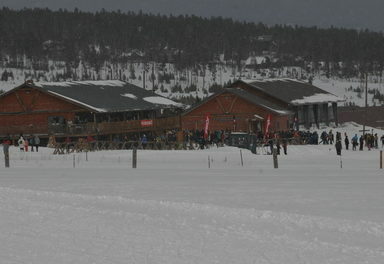 The CHSSL (Colorado High School Ski League) season this year consists of 5 weekend races in January and February, culminating in the State competition held February 22-23 in Leadville, CO. To qualify for state, racers must compete in at least 2 races of that particular discipline and place in the top 45% in at least one race. Leading the team this year is new head coach, Mike Lohman, and assistant coach, Dave Cleveland. Both bring many years of coaching and Nordic racing experience to the team. In addition several other talented coaches are lending their time and expertise to include Snow Mountain Ranch Nordic director and CXC coach Bill Pierce, former MPHS head coach Travis Fuqua, and Winter Park Comp Center coach Jessica Jortberg.